It was a good night for Democrats in some of the nation’s largest cities. New York’s Democratic Mayor Bill de Blasio, a forceful critic of President Trump, easily won a second term. And Democrats also won several major cities and closely watched races, including those in Boston, Charlotte, N.C., and Seattle. With all of the precincts counted, de Blasio had 66 percent of the vote to 28 percent for his main rival, Republican Nicole Malliotakis. In Boston, incumbent Democrat Marty Walsh glided to re-election and a second four-year term, beating back Roxbury City Councilor Tito Jackson, who had hoped to become the city’s first African-American mayor. With 100 percent of the precincts counted, Walsh had 65 percent to Jackson’s 34 percent. Boston.com writes: “Jackson had argued that soaring rents and property values were pricing many residents out of the city. Walsh touted creation of more than 20,000 units of affordable housing since taking office.” Member station WBUR has more. Detroit Mayor Mike Duggan addresses a ceremony honoring 15 Detroit entrepreneurs in Detroit in January. 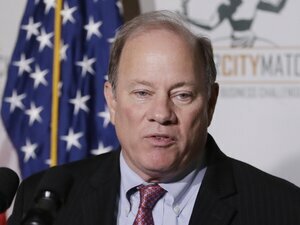 “He accused Duggan of being corrupt, favoring downtown business interests over neighborhood concerns, and effectively creating ‘two Detroits:‘ one for prosperous newcomers, and another for mostly poor, longtime city residents. 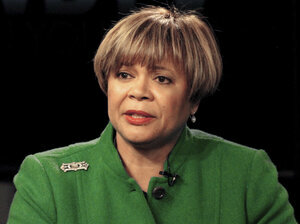 Charlotte Mayor Pro Tem Vi Lyles answers a question during a mayoral debate. In Seattle, Democrat Jenny Durkan has taken a commanding lead over her opponent, Cary Moon, in a race to replace former Mayor Ed Murray, who resigned amid sexual abuse allegations. If she wins, she would become the city’s first female mayor in decades. Member station KUOW is following the story. The Atlanta mayoral candidate only managed to narrow a crowded field, with Keisha Lance Bottoms and Mary Norwood taking the top two slots. They will face one another in a Dec. 5 runoff. The candidates are vying to succeed term-limited Mayor Kasim Reed. AJC.com is following the local races. A previous version of this story said that a runoff in Atlanta will give the city its first female mayor. Actually, Shirley Franklin was mayor from 2002-2010. In addition, Seattle mayoral candidate Cary Moon was incorrectly identified as a Republican. Next up for Phil Murphy: His transition to power. Here’s how it works.